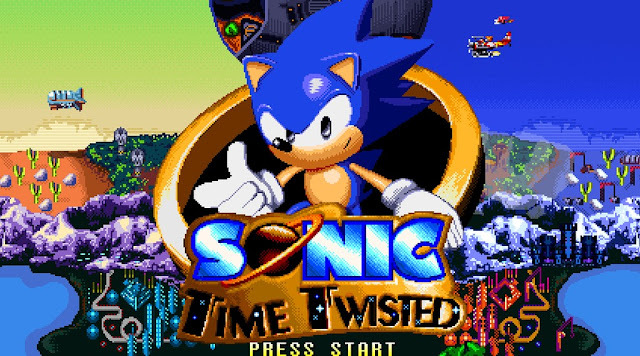 Indie Retro News: Sonic the Hedgehog Time Twisted - A high grade Sonic fan game, finally gets a release! Sonic the Hedgehog Time Twisted - A high grade Sonic fan game, finally gets a release! Do we have some great retro gaming news for you, as that legendary game character Sonic from the Sonic the Hedgehog game series, which appeared on multiple systems including the Sega Master System and Sega Game Gear, has appeared in an all new high grade fan game as 'Sonic the Hedgehog Time Twisted', which has finally been released. Developed using GameMaker Studio, this latest fan game is modelled after Sonic CD, Sonic 3 and Knuckles, and features a new story in which you need to collect Chaos Emerald and Time Stones to stop Metal Sonic from resurrecting his creator. With over 12 years of development time as a freeware gift to fans of the original. Sonic the Hedgehog Time Twisted features new playable levels from zones such as Attraction Attack, Viridian Valley and Frigid Fortress, refined physics with AeroGP's super accurate engine, custom pixel art, three characters to play as, new and returning elemental shields, high grade cd quality music, a new take on the time travel mechanic, and much more that could make this a worthy Sonic game for all the fans.